AguaPods is a division of Dagua. All our Pods are shipped in 20 or 40 foot containers customized to the client’s needs. With over twenty years of experience in the field, Dagua’s technological success reflects its commitment to developing practical solutions for purifying water. A privately-held company, Dagua is led by a team of leaders in engineering, and corporate management. The company’s technical partners include university research chairs, accredited laboratories, and engineering firms. Now represented in over 25 countries, Dagua through their partnerships with clients have best facilitated the deployment, commissioning, operation and maintenance of its systems and plants. In the municipal sector, where operating costs are financed through tax revenue, it is especially important to consider all costs associated with water treatment technology. And Dagua has nothing to fear from comparison. 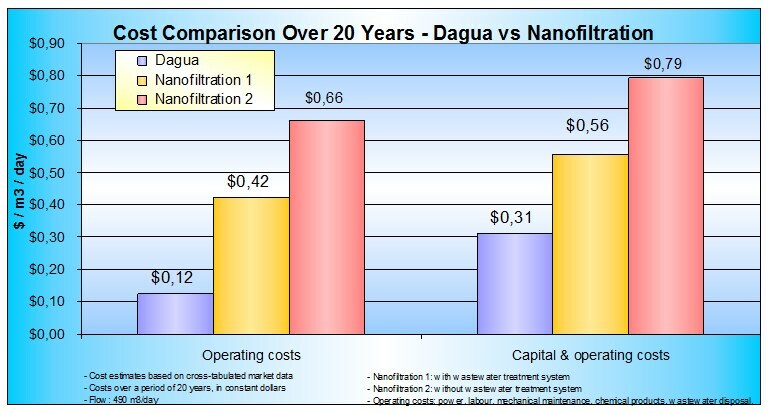 The following table compares unit costs for DaguaFlo-UMF technology with those generally associated with membrane filtration and nanofiltration in two types of installations. In terms of both operating costs alone and combined operating and capital costs, the Dagua solution is by far the most cost-effective choice. Moreover, Dagua is also competitive in providing turnkey projects that include its treatment technology and all peripheral infrastructure (e.g., building, reservoir, power generator). 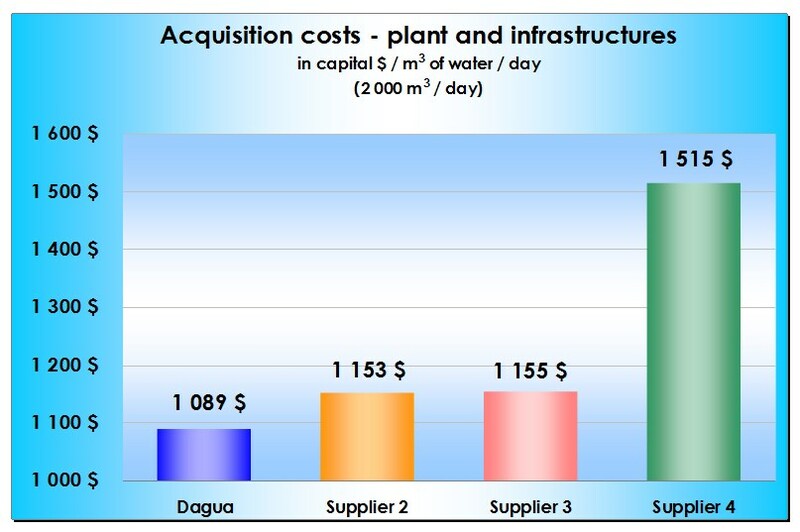 Table 2 compares the Dagua solution with those of three other competitors for a project with a design flow of 2 000/ m3 per day. All told, the technological breakthrough that Dagua has accomplished in chemical-free water treatment enables community decision makers to balance their financial capacities with both regulatory requirements for drinking water and the growing support for sustainable development. The Aguapods containerized drinking water solutions are based on the Dagua Technology that has been developed over 20 years. Dagua is a manufacturer of mid to large scale drinking water plants. Using the DaguaFlo solution not only streamlines plant operations by eliminating the need for chemical products and sludge management, but continuously monitors drinking water quality and plant operations as well. Regardless of variations in the quality of your raw water, you can always count on a reliable supply of high-quality drinking water, with only 60 minutes of operator attention per day.